New Yorkers are a notoriously spoiled bunch. With everyone from FreshDirect to Chinese takeout on speed dial, rare is the occasion we actually have to leave our homes. Another service waiting right on our doorsteps? 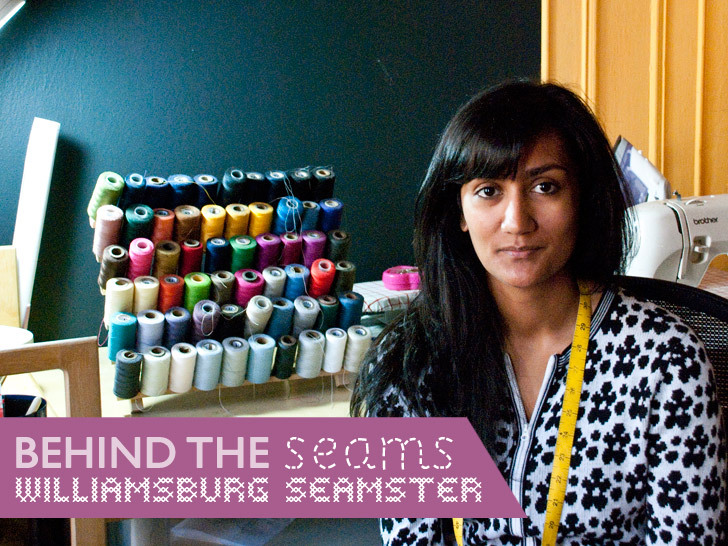 Fittings and alterations, courtesy of Nayantara Banerjee, the Williamsburg Seamster. Banerjee isn't a pinched-faced old lady hunched over a sewing machine, however—far from it. Young, mobile, and adept, the Brooklyn resident defies stereotypes by making house calls to a growing roster of clients in and beyond her neighborhood. Her prices aren't exorbitant, either: Simple repairs start at $3, hem jobs at $25, and zipper replacements from $30. Ecouterre made an on-site visit of our own to observe the Seamster in her element, as well as to chat about "make do and mend's" role in the burgeoning sustainability movement. What inspired you to start a custom design and tailoring service? I had been working full-time for BurdaStyle.com, where sewing enthusiasts can customize and make their own sewing patterns, but had taken up custom design and tailoring on the side for friends and friends of friends who knew I could sew. Previously, I worked for a bespoke women’s suit company, and my experience there really made me understand the value in a well-fitted garment. My first client base from this circle of friends seemed to appreciate my insight. They also continued to tell me how great it was to have found me, or how they’d been looking for someone like me for ages. The growing number of vintage stores offer a way to create unique wardrobes but few, if any, provided alterations. Around this same time in Williamsburg, more and more shops were popping up all around me with great curated selections of either vintage or young and new designers. They offered a great way to create a more specialized wardrobe, and shop locally, but few, if any, offered tailoring or alterations. I went around to meet the shop owners and let them know what I was doing, and that it might be a mutually beneficial relationship for both of us. I realized I was able to provide a service that was greatly in need. From this, I was able to get a great word-of-mouth marketing program off the ground. I realized I was able to provide a service that was greatly in need, and so I eventually left BurdaStyle.com and set up shop as The Williamsburg Seamster in February 2008. I was for hire as a traveling seamstress, meaning I went to the clients for fittings and deliveries, and I worked on the garments in between at my home or in a studio space I was sharing in Red Hook. How many clients do you have? How do most of them find you? Last year, I had probably around 200 to 250 clients, though I did leave the country for two months to volunteer with Awamaki, so this year I will probably see more than that. I’ve slightly changed the way I offer my services in the past year so that I can see more clients. This means I travel to see clients in their homes, but I also see more and more clients at my workspace. To see more clients, I’ve also been meeting a growing number at my workspace. Most of them find me through online searches, which lead either to my Yelp.com page or directly to my website. I have also been lucky enough to get a lot of press in the past year and half, including the New York Times, NBC New York, Time Out New York, and Brooklyn Based. How does your work play a role in the sustainable fashion movement? I am in a great position to offer garments that would fall under the “slow fashion” movement, and having clients that appreciate this is incredible. By providing my services, I am offering an alternative to mass-produced garments available at retailers. I can also source eco-friendly, nontoxic, or organic supplies, down to the products used to pre-treat the fabric. By providing my services, I am offering an alternative to mass-produced garments available at retailers. Fabric choice is up to the client, but often they choose organic or sustainably harvested fibers or they purchase remnants and designer overstocks that would otherwise be thrown away. Updating vintage and secondhand pieces can also be considered part of the slow-fashion movement, and I find many clients are thrilled when they can salvage something as opposed to tossing it. I find many clients are thrilled when they can salvage something as opposed to tossing it. I find that the clients love being a part of the process; working with an individual seamstress really helps them understand what goes into making a garment. I think they can look at mass-manufactured clothing with a more critical eye and from there they also spread the sustainable-fashion movement ideals. I always clearly state that I will not create a knockoff or replicate in entirety any design that can be purchased in stores now. Do you collaborate with bigger design labels? I don’t work as a sample or production room, since I can’t take on workloads that large when I am already booked with sewing for individuals. I do, however, love to help out when I can, whether it’s final touches before a presentation or show or sewing smaller batch orders. Generally, the designers I work with are people who are existing clients who’ve hired me for their personal needs first. Generally, the designers I work with are people who are existing clients who’ve hired me for their personal needs first. What’s one of your most memorable or favorite projects you’ve worked on? I made a Halloween costume for a two year old boy a few years ago—it was a replica of the outfit in The Harlequin by Picasso. It involved quilting together squares of blue and gold fabric, top-stitching black velvet ribbons, and then making the actual garment. Fittings on this very excitable two-year-old were rather difficult, but I’m pretty sure he loved it—though not as much as running around in his diapers—and it looked adorable! Part of the charm of your business is that you manage all fittings, designing, pattern-making, sourcing, and sewing on your own. As your reputation grows, how do you plan to handle the growing demand for your services? Currently, I have an assistant who joins me one-to-two days a week. She’s a real help when it comes to prepping the pieces for me to alter, which means undoing seams, removing zippers, and marking. We’ve been slowly adding more to her workload so I can take on more, but it’s a time-consuming skill to learn, and so it’s a slow transfer of information. I am such a hands-on person that it has been tough to delegate or even hire more people. I would love to have more help as time goes on, so that I can turn down fewer people or have a shorter turnaround, but I find that I am such a hands-on person—and part of my draw is my personality—that it has admittedly been tough to delegate or even hire more people. I might expand with a bigger staff to a storefront, as opposed to my apartment from where I work now, but I would still want to be involved in—and oversee—everything. When it really comes down to it, the reason I started this is because I love to sew. I want to sew, not simply manage other people sewing. Banerjee charges $30 for stopping by your home or workplace, but she waives the fee if your alterations exceed $150. Working full-time at BurdaStyle.com, she found a growing demand for her sewing skills from friends and friends of friends. "My first client base from this circle of friends seemed to appreciate my insight," she tells Ecouterre. "They also continued to tell me how great it was to have found me, or how they'd been looking for someone like me for ages." At the same time, thrift stores were multiplying by the day in her Brooklyn neighborhood. Although each one presented an expertly curated selection of vintage garments, few, if any, offered on-site alterations. By extending her services, Banerjee was soon able to parlay her talents into a brisk business. "I was for hire as a traveling seamstress," she says. "I went to the clients for fittings and deliveries, and I worked on the garments in between at my home or in a studio space I was sharing in Red Hook." These days, Banerjee meets between 200 to 250 clients, although she expects that number to grow. "I've slightly changed the way I offer my services in the past year so that I can see more clients," she says. "This means I travel to see clients in their homes, but I also see more and more clients at my workspace." Most of her clients find her through online services, but Banerjee also credits recent press in the New York Times, NBC New York, Time Out New York, and Brooklyn Based for expanding her base. By helping her customers update vintage and secondhand pieces, Banerjee sees her business as the antithesis of mass-produced fast fashion. "I find many clients are thrilled when they can salvage something as opposed to tossing it," she says. One thing she won't do, however, is knock off another designer's work. Neither will she outsource her job to someone else. "When it really comes down to it, the reason I started this is because I love to sew," she says. 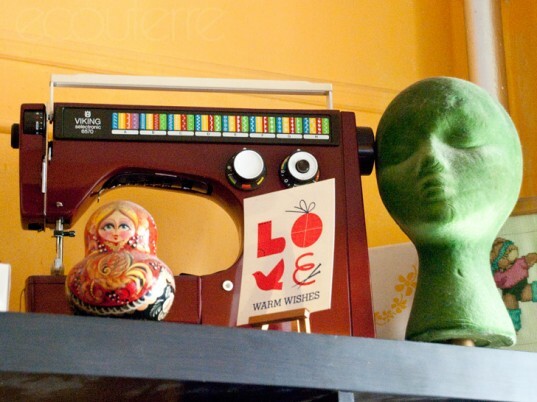 "I want to sew, not simply manage other people sewing."